MONTVALE – The turnover rate in players and staff that accompanied last year’s historic season for the boys basketball program made handicapping this year’s prospects almost impossible and the worst guy to ask would have to be the Patriots’ head coach Rob Carcich. He basically had no answer when asked if he was surprised that his team is now 9-1 after a 51-36 win over Dwight-Englewood on Sunday in Public vs. Private Showcase held at St. Joseph Regional High School. Carcich was a late addition and the lone holdovers from the team that won the program’s first ever Passaic County Tournament title were Jake Belli and Pulast Thacker, the only two players on this year’s roster that played any meaningful varsity minutes a year ago. It was a hasty arrangement, but the results speak for themselves and there is one word that has served as the basis for the relationship. The zone that Carcich teaches forces opponents to shoot it well from the outside to have a chance and Dwight-Englewood had trouble finding its range on Sunday. The Bulldogs were held to single digits in each of the first three quarters and never led in the game. Jordan McKoy finished with 12 points for Dwight-Englewood, which is now 6-3. Thacker made a foul line jumper 28 seconds into the game to give Wayne Hills the lead for good. Thacker hit two free throws and Belli had a three-pointer from the win 2:19 into the game gave the Patriots a 7-0 advantage to start the game. A pair of first quarter three-pointers by JP Lemchak gave Wayne Hills leads of 12-3 and 15-9, which was the score at the end of the opening period. Dwight-Englewood hung around for the remainder of the first half with two Jordan McKoy buckets keeping the Bulldogs close. McKoy, a senior and four-year varsity starter who has committed to Merrimack College, which will begin its transition to Division 1 next season, got free in transition and scored to make it 17-12 and he made a jumper from the baseline to make it 19-14 before Belli’s two free throws upped the Wayne Hills advantage to 21-14 at halftime. Belli, who took over the point guard spot from his brother Joey (now playing at St. Anselm College), has stepped up and made the transition a seamless one. Jake Belli is the consummate point guard who gets his teammates involved, scores when he has to and controls tempo whether that means slowing things down and pushing the pace. Nebi Ademi scored 12 of his 16 points in the second half for Wayne Hills, which improved to 9-1 on the season. Jake Belli and Nebi Ademi combined to score 15 of the Patriots 16 third quarter points as they opened up a 37-22 lead after three quarters and when Dwight-Englewood made its last stand early in the fourth, Belli sensed the danger shut it down. Inside the first minute of the fourth quarter David Mager and Harrison Ruff hit three-pointers that pulled Dwight-Englewood to within single digits at 37-28 with still 7:17 to play. The next time down the floor Belli made the entry pass into the post for Ademi and then cut to the basket. 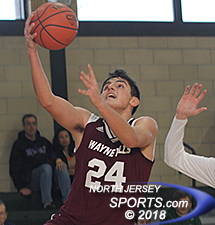 Ademi made the return pass for a Belli layup and, 16 seconds later, Belli turned a Dwight-Englewood turnover into a Euro-step layup on the break to make it 41-28 and Wayne Hills pulled away from there. 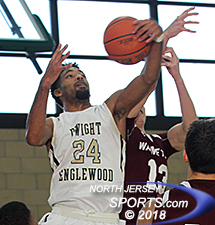 McKoy (12 points) was Dwight-Englewood’s lone double digits scorer. Ruff (6 points) made half of the Bulldogs’ four three-points and Mager and Judah McIntyre each finished with 5 points. Dwight-Englewood fell to 6-3 on the season, but is still in line for a spot in the Bergen County Jamboree. Belli led Wayne Hills with 18 points and Ademi scored 12 of his 16 in the second half as the Patriots pulled away. Lemchak made two of the Pats’ three three-pointers and finished with 7 points off the bench. Brett Wood scored all 6 of his points in the fourth quarter and Thacker scored all 4 of his in the first. It’s been an eventful season already for Wayne Hills, whose only loss was on a buzzer-beater on the road at rival Wayne Valley and it was fresh off a buzzer-beating win of its own when Jason Sanfilippo sunk Fair Lawn with a jumper last Thursday. The Big North Independence Division should be like that all season and the Passaic County Tournament has no clear favorite yet, either. Wayne Hills, despite turning over its whole coaching staff and most of its roster, is right in the middle of everything.